Think about it. there are tons of chicken references in our society. Much more than Hip Hop. Erica was compared to Kirsty Alley and she just won't have it! She's a good layer, but is that a compliment for the kid at the feed store? He craves your attention, and then pretends he doesn't care. Isn't he a bit like you amd me? A restless, but satisfied eye on everything. "Is that a tomato? Don't mind if I do..."
I’ve become a Chicken Wrangler. But it’s a calling (or crowing) I can’t deny. Besides, nights out in the back 40 aren’t all that bad. 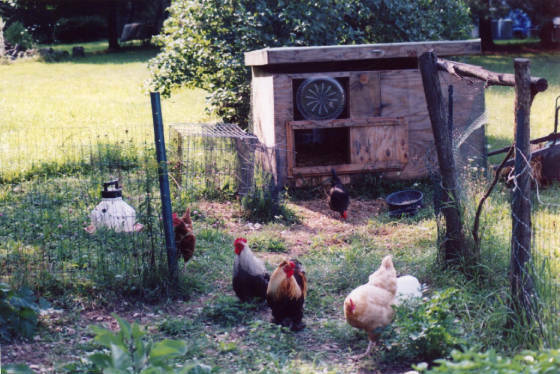 I have the chickens for company, and my harmonica – and I am only 40 paces from indoor plumbing and the ice machine, so I guess its more like Chicken Wrangling Light. I do now, in fact, have chickens. 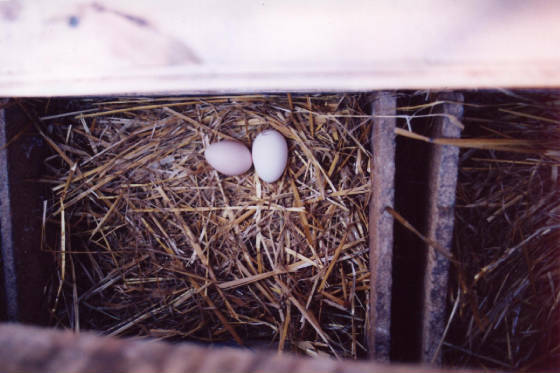 Three egg laying hens and two roosters. Friends were moving to a job in DC and had no one to take them. I had thought about chickens for a while, and took the leap. A friend knew of an insulated double dog house he built for greyhounds (now gone) that would make a great coop – and it does. I added a window, sliding door, and need to retrofit the roof, but everyone seems happy with it, thank you very much. I stand there and tell them all the filthy barnyard jokes I know. They hum, cluck and shake their heads. Some things remain constant among species…. 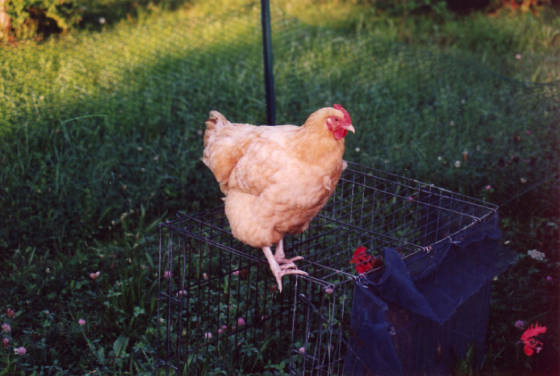 I hooked the chicken run to my garden, because I was told they will scratch the dirt and eat bugs. Which they do. I was also told they love tomatoes. Which they do. I don’t have one tomato left on the vine. I keep smelling their little beaks looking for the culprit, but they cover up with the Animal Crackers. And it’s a big Chicken Conspiracy – nobody’s talking. They just stand there and stare at me without blinking. The first one I catch “red handed” is going on the grill to send a message to the rest of them. I HAVE THUMBS AND MATCHES, SO DON’T TOY WITH ME! Or my tomatoes. But there is an evil side to some chickens. Chickens can actually go cannibal. 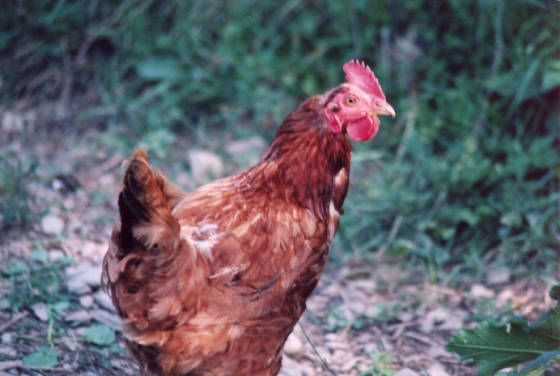 So the thought of flesh eating chickens in the back yard at night is a bit disconcerting. I lie awake looking for large, feathered shadows on the wall and listen for the scratch of claws on my hardwood floors. I dread the smell of Animal Cracker breath in my darkened bedroom. The crowing in the a.m. sends me through my sleep deprived skin. So I have taken the usual precautions – hanging bags of garlic, lemon and rosemary in the windows and nailing grilling tools above the doors. I am not Chicken, mind you, just cautious. Time will tell. No deep thoughts this summer. I am irritable with the heat, the job suffices, still get a few divorce tremors in the mail, and been working and trying to enjoy this short period when the height of summer makes this Mid Summer Night’s Dream seem eternal. My basil is growing great, and I am having a lot of success with the hot peppers. I feel some changes coming on and hope to come out of the other side with a more clear perspective. 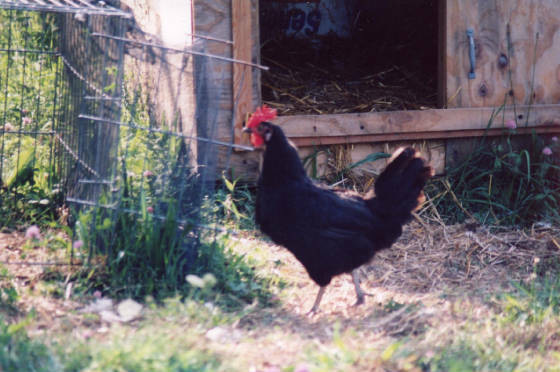 Black Bart is the black bantam rooster. 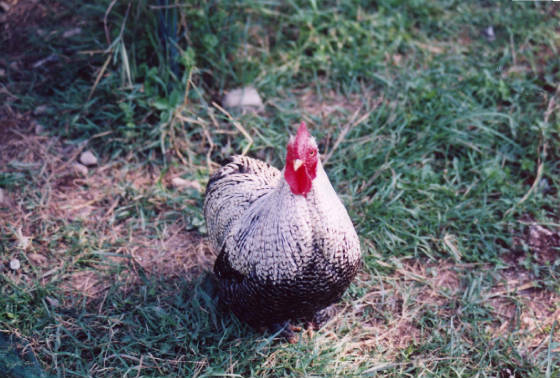 I was offered the name “licorice”, but a fierce war rooster deserves better. Bart is in charge. He is the first one out of the house in the morning and the last on in at night. He keeps a distance from me and is flighty but alert. 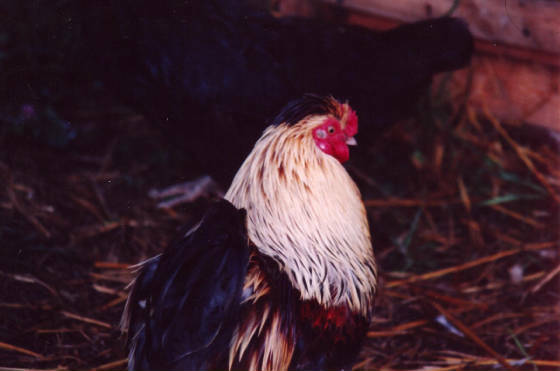 Erica is the big reddish hen and Kim is the darker red bantam – both my main layers. The two girls at the hardware store asked me to name two hens after them. So the hair color dictates the names. Erica (the hen) may be the oldest. Everyone else picks and pecks on her, but she is the double the size and sweeter than the other ones. She is my Grand Galion of the Garden and has grace all to herself. Karin rounds out the flock. She is the prettiest and very feisty. So I named her after the beautiful, dark haired Viking I know in Danmark.